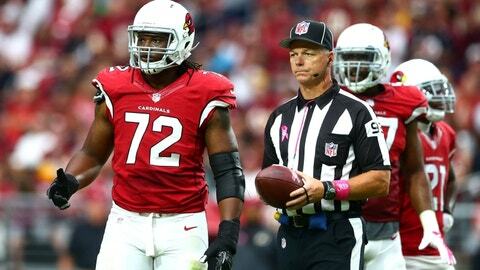 There’s no doubt that the upcoming offseason will be a busy one for the Arizona Cardinals. Management’s work will certainly be cut out for them, with 20-plus of their own players set to hit free agency. But free agent decisions are only part of the equation. There’s a handful of Cardinals currently under contract for the upcoming season who the club could survive without. With all the team’s scheduled free agents, any and all salary cap room would be helpful. Cutting ties with some or all of the players not critical to the Cards’ success could provide that room. The front office shelled out $15 million to extend cornerback Justin Bethel in December of 2015. While he’s a Pro Bowl special teams performer, his work at the corner position has left much to be desired. Special teams coach Amos Jones would certainly miss his services, but the money he’s being paid could be spent much better somewhere else. Defensive tackle Corey Peters signed with Arizona in the spring of 2015, then ruptured his Achilles that August. He was back in ’16, contributing a measly 21 tackles. His backup, Rodney Gunter, would almost definitely top that production for a lot less money next season. It’s almost a certainty that tight end Troy Niklas will disappoint the organization in 2017. He’s really good at getting injured, that’s for sure. Niklas has provided a grand total of eight receptions over three campaigns, so cutting him loose may be a logical move. Defensive back Tyvon Branch was OK last year in his first season in the desert. But injuries caused him to miss nine games, and at 30 he may be past his prime. His money could go towards bringing back free agents Tony Jefferson, D.J. Swearinger or both. Though backup quarterback Drew Stanton performed admirably in 2014, his played has dipped ever since. He’s amazingly inaccurate for a veteran (his completion percentage was a putrid 39.6% last year). Another case of a salary that could be better spent elsewhere. Defensive end Ed Stinson was branded “the next Darnell Dockett” by Dockett himself in 2014. But his production over the last three seasons would say otherwise. His 22 tackles and one sack as a Cardinal may not be enough to keep him around next season. Cutting non-productive players to retain those who can help your squad get to a Super Bowl should be a no-brainer. In such an important year for Arizona, every little move can make a difference.